Drummer, percussionist, music educator and blogger. I know I've posted before about some of the misconceptions surrounding being a successful rock/pop drummer, but I had another experience this week that I thought I'd add to the canon of scripture for aspiring studio drum-smackers. While talking with this guy about studio drummers and why they may or may not be called for a certain project, we started talking about the difference between time-feel and "chops." If you'll allow my paraphrasing, the conversation went something like this. RT: "Come on. When's the last time you listened to a pop tune and thought, hey, wait - that drum fill wasn't complicated enough?" Now, I know I don't have to draw too much of a conclusion here, but I will, anyway! 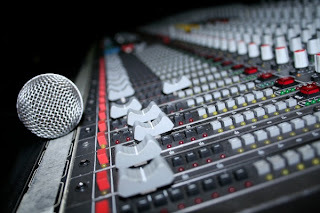 I'm certainly not saying you shouldn't strive for as much technical facility as you can get, but there are three basic things (and two of them are almost the same thing) a drummer must do to get consistent studio work. Play nice with the click. Remember, as a musician, you're a servant to the music. You should always play just what the track/project/piece needs, and nothing more. Today's post is another contribution from guest blogger Emily Sorensen in honor of Jazz Appreciation Month 2013. Please feel free to leave comments below. 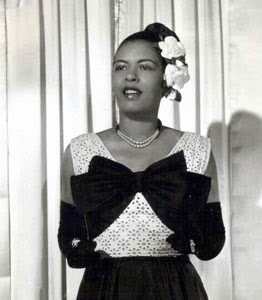 Strange Fruit is an iconic song made famous by Billie Holiday. First recorded in 1939, Billie's version was inducted into the Grammy Hall of Fame in 1978. In 1999 TIME magazine called it the, "song of the century." The recording - even the performing - of this piece was an incredibly bold statement long before the mainstreaming of African-American civil rights was in full swing. The atrocities in the South and elsewhere were not talked about (a proverbial elephant in the room, if you will), let alone given the full, unvarnished spotlight by a prominent artist. The lyrics of Strange Fruit are from a poem written by Abel Meeropol, an English teacher at Dewitt Clinton (a public high school in New York), as well as a poet and social activist. The poem is titled Bitter Fruit and was published in 1937. Mr. Meeropol put this particular song to music himself (he would often ask others to put his poems to music). It gained certain success as a protest song in and around New York. The simple melody is as haunting as the lyrics. It lies within a transparent - almost non-existent - arrangement. The song begins with a disturbingly mournful instrumental introduction, only to lead to an even more disturbing metaphor of the southern lynching. It ends abruptly, without harmonic resolution. The song has been recorded many times over the years. For example, Herbie Hancock and Marcus Miller did an amazing and haunting instrumental cover of the song with Marcus conjuring the melody with his bass clarinet. I was first introduced to this song as a college Senior when observing an English 1010 class. I no longer remember the point of the class discussion, but I will never forget when the professor handed out a copy of the poem and then played first a rap version of the song followed by Billie Holiday's seminal rendition. I remember tears trickling down my face and knowing my life would never be the same. Being an avid student of the Civil War and of civil rights heroes - the likes of W.E.B. Dubois, Martin Luther King, Jr and others who advocated a non-violent approach to civil rights advocacy - I was deeply moved by Billie's ability to use melody and song to evoke a living metaphor from the lyrics. That day Strange Fruit became one of my favorite works - not because I was necessarily uplifted by the message, but because it was delivered in a way that spoke to all who heard it, whether they were comfortable with the protest or not. Have a listen for yourself - and be assured you can never be the same again. April is Jazz appreciation month - JAM! Guest blogger Emily Sorensen visits again with an introduction to Jazz Appreciation Month, and 2013's theme. Designated in 2001 by John Edward Hasse, PhD of the Smithsonian's National Museum of American History to honor jazz as an original American art form. The 2013 theme is "The Spirit and Rhythms of Jazz". April was chosen to celebrate the birthdays of Jazz greats like Duke Ellington, Ella Fitzgerald, and others. However, jazz appreciation encompasses more than recognizing the iconic performers, it relies upon educators, libraries, museums, and musicians all through America to teach and cultivate this unique cultural expression. Many resources are available to increase understanding and appreciation for this great American art form. One of the great works shedding light on the history and growth of jazz music is the 10 part series Jazz: A Ken Burns film; it is a pretty accurate review of the history of Jazz. Enjoy this fantastic opportunity to embrace this amazing piece of our American culture and history. National Endowment for the Humantities - Edsitement! Do I really need to read music?